I'm probably 5 hours in and I can't think of anything bad to say about it. Just a phenominal game. I played all night and now I'll be miserable tomorrow. Worth it. pearl, BlazingRebel, DuckD and 1 other person like this. DuckD and lazytweaker like this. New version of game will be available on Xbox One and PC too. Square Enix has announced Rise of the Tomb Raider will launch on PlayStation 4 on October 11 in a new 20 Year Celebration edition. This version of the game will feature "a completely new story chapter entitled Blood Ties." In addition to this, it will have new co-op Endurance gameplay, PlayStation VR support for the new Blood Ties chapter, all previously released DLC, extra outfits, weapons, and Expedition Cards. A limited edition art book will also be included. All this content will be available for free to Xbox One and PC to players that own the season pass. This, however, won't include VR support. The season pass will be updated to include this content going forward. A season pass does not exist for PS4 as all the extra content is included in the new version of the game. "[Crystal Dynamics] is celebrating with all Tomb Raider fans, thanking them for being on Lara's 20 year journey with us," said Scot Amos, co-head of the studio. "The team has packed in surprises, new story, and the top-requested special features into this 20 Year Celebration edition. "Blood Ties, a new premium DLC, beckons players to explore Croft Manor in a new story mode; then defend it against a zombie invasion in Lara's Nightmare. When Lara's uncle contests ownership of the Manor, Lara must explore the estate to find proof that she is the rightful heir, or lose her birthright and father's secrets for good. "Players can then test their zombie-killing skills in the replayable Lara's Nightmare mode: a haunted Croft Manor where players have new challenges and must rid the Manor of an evil presence." According to a press release, the PlayStation VR support lets players "unlock the mysteries of Croft Manor in first-person, while the new co-op Endurance mode lets fans team-up in the wilderness. "Two players must team up to survive the harsh elements by day, as well as lethal threats from enemies by night. Fire takes fuel, food restores health, and every resource must be hunted, collected, or crafted. Battle to the top of the leaderboards, as others try to beat your longest survival run." To celebrate the history of Tomb Raider, a re-envisoned version of the cold-weather outfit and the Hailstorm pistol Lara used in Tomb Raider 3 will be available in the mode. A classic Lara card pack will let players play as various iterations of the character from over the years, including the original Lara model that started it all in 1996. Finally, the game will have a new Extreme Survivor difficulty: "This new difficulty level takes the toughness of Survivor and ratchets it up several notches starting with all checkpoints being stripped out of the game. The only way to save the game is forage enough resources to light campfires." 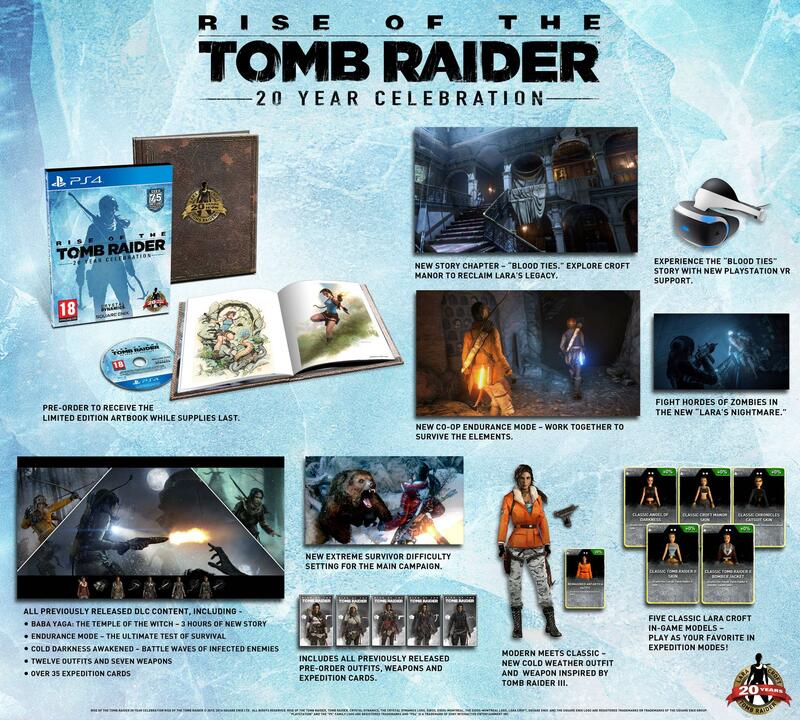 Take a look at the infographic below to see everything included in the Rise of the Tomb Raider 20 Year Celebration release. Making the deal even sweeter. 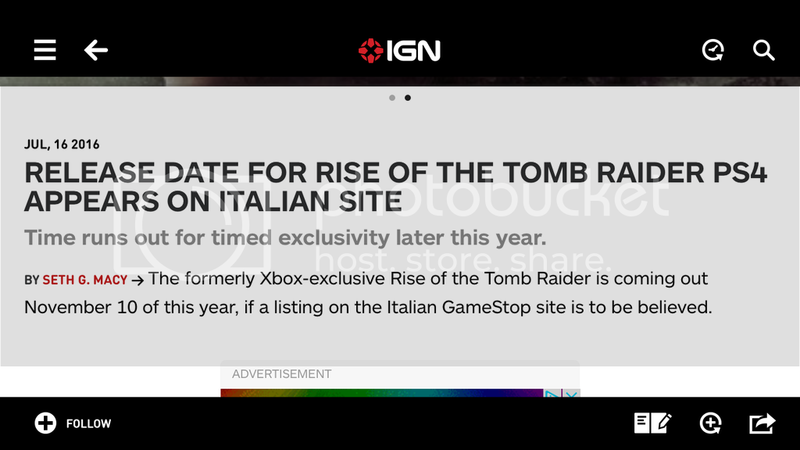 It was a bit of a bitter pill for PS4 players to swallow that last year's Rise of the Tomb Raider was a timed exclusive for Xbox One (it came a few months later to PC). 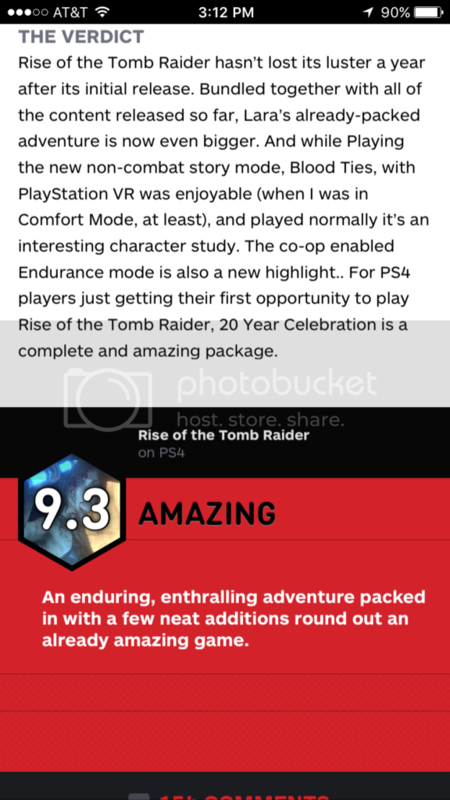 But the game is finally coming to PS4 in October, and it's shaping up to actually be a pretty good deal that's just gotten even better: If you preorder Rise of the Tomb Raider on PS4, you'll get a copy of Tomb Raider: Definitive Edition for free. The preorder bonus was revealed on the PlayStation Store listing for Rise of the Tomb Raider. Tomb Raider: Definitive Edition is the PS4 remaster of the Tomb Raider series' 2013 reboot that was critically acclaimed at launch. It's worth noting that this bonus is only for digital pre-orders; buying the game through the PSN Store will grant you a PS4 download for Tomb Raider: Definitive Edition. Rise of the Tomb Raider is launching on PS4 alongside a suite of additions and changes to the game. On all platforms, the game is getting a new singleplayer, narrative-focused mode called "Blood Ties," a zombie horde mode called "Lara's Nightmare," and a co-op mode called "Endurance." The PS4 version, called "20th Anniversary Celebration," will include all of these new additions, PS VR support for Blood Ties, all previously released DLC, and new costumes and skins. On Xbox One and PC, the new modes will be free for owners of the season pass. You can read more about the additions here. The game launches on PS4 on October 11. 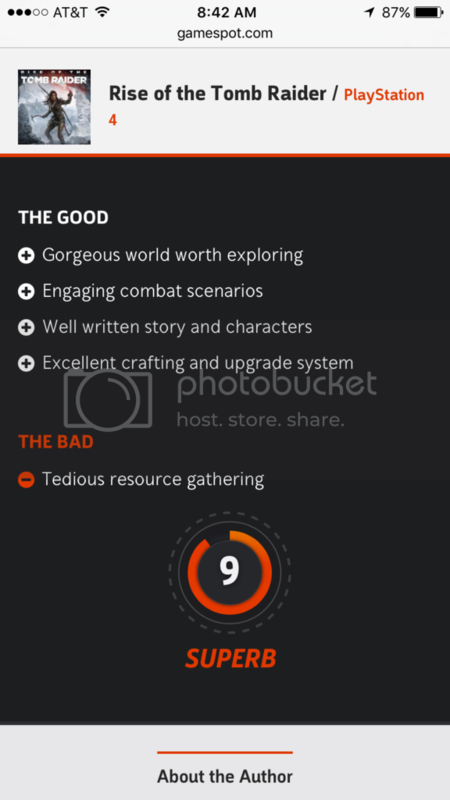 When it originally released on Xbox One, GameSpot gave it a 9/10. You can read our full review here. Keef and UncleItchyBalls like this. Sub-Zero, pearl and prerecordedlive like this. Finally about to start this (had to beat Mafia 3) Currently see Sub-Zero playing it. We're going to have to try out that endurance mode this weekend. Started but playing slowly. Not very far at all. Great looking game. I forgot how much I loved the bow and arrow these games. Story was great...i need to go back in and play some DLC stuff that came with the PS4 version. Hopefully the story in this one is better than the previous one.